Bringing change to our public school system is hard, and the current system of education governance creates barriers that can make that reform even harder. Here six authorities in public education discuss how local philanthropies can overcome them even if school districts cannot. 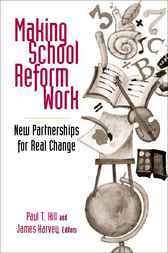 Making School Reform Work identifies new institutions that can be created by foundations and civic groups to remedy deficiencies in local school governance, formulate bold reforms, and guarantee implementation. These institutions include incubators for starting new schools, independent data analysis centers, public-private partnerships for recruitment and training of school leaders, and new ways of funding and managing school facilities. The contributors are Sarah Brooks (Carleton College), Michael DeArmond (University of Washington), Marguerite Roza (University of Washington), and Abigail Winger (Milwaukee consultant).